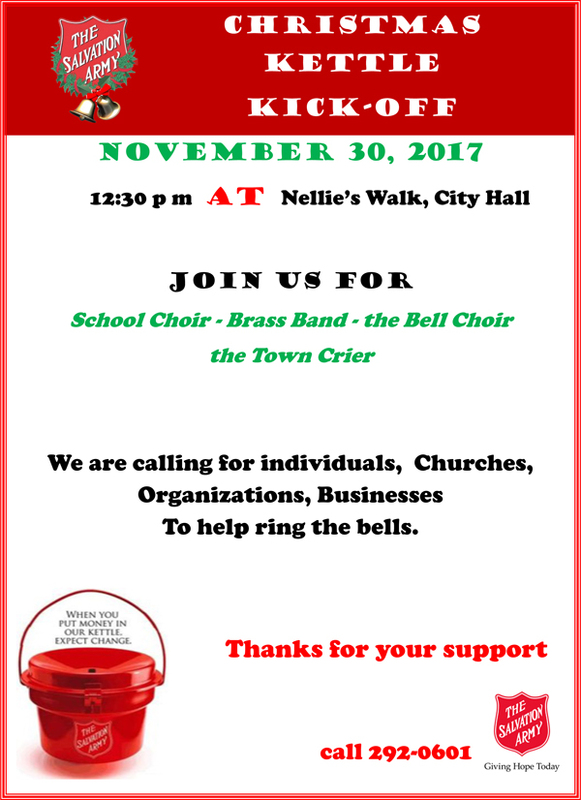 The Salvation Army will be holding their Christmas Kettle Kickoff on Thursday [Nov 30] at 12.30pm at Nellie’s Walk, City Hall. A spokesperson said, “The Salvation Army will be holding it’s Christmas Kettle Kickoff at Nellie’s Walk, on Thursday, November 30, 2017. “The Opening will start with music from the West Pembroke School Choir at 12:10 and the SA Brass. The Salvation Army Christmas Kettle is one of most recognizable charitable campaigns throughout the world. “In Bermuda over the last 10 years, this symbol and increased visibility, along with the charitable gifts of many has made it possible for the Salvation Army to serve many families who do not have or find themselves not quite able to make ends meet at this holiday period of the year. “Come out and help promote the ‘giving to the kettle’ that Gives Hope Today.